The threat of climate change has given the United States an opportunity to be a technological leader and set a global example of how to transition towards a clean energy economy. As U.S. policymakers begin to consider policies like the Green New Deal, we encourage them not to overlook a key tool for reaching climate goals: nuclear energy. Today, fossil fuels fulfill roughly two-thirds of our country’s energy needs, emitting carbon and harmful air pollutants. Although renewable energy is growing and new technologies such as carbon capture and sequestration are being tested, these trends alone won’t be enough to decarbonize our economy. Advanced nuclear technology like NuScale Power’s small modular reactor (SMR) provides reliable, baseload power that, unlike fossil fuels, emits zero carbon. Indeed, a recent MIT study confirmed that combating climate change will be difficult and expensive without nuclear energy. Furthermore, SMRs can enable greater deployment of variable renewables, like wind and solar, by having the capacity to load follow and meet energy needs when renewables can’t. Energy infrastructure that integrates SMRs for load-following power can be renewables-heavy and remain zero carbon without sacrificing flexibility and reliability. Nuclear power is critical for achieving deep decarbonization, particularly for the hard-to-tackle emissions of the industrial sector. 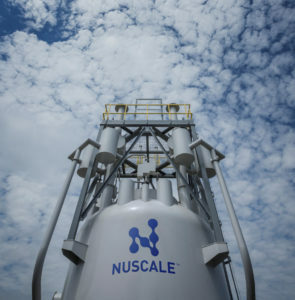 A single NuScale power module produces 60 megawatts of clean, affordable and reliable energy, enough to power 45,000 American homes with carbon-free electricity or to provide process heat for applications, such as desalination, hydrogen production, and other industrial and manufacturing processes. Fortunately, SMRs are on track to becoming a reality in the United States. Last year, the U.S. Nuclear Regulatory Commission (NRC) completed the first and most intensive phase of review for NuScale’s design certification application—the first and only SMR ever to undergo NRC review. By 2026, NuScale and the Utah Associated Municipal Power Systems (UAMPS) will commercialize the first SMR nuclear power plant in the United States. Now is the time to help policymakers understand that nuclear power is a critical piece of our future clean energy puzzle. Forward-looking energy policies should prioritize clean energy solutions while remaining technology agnostic so that innovation and economics can deliver the most efficient and effective energy infrastructure. Such an approach will allow us to harness the full power of SMR technology to meet clean energy goals and mitigate climate change. 1) What role should advanced nuclear—like SMRs—play in the U.S. energy future? 2) What policies can best ensure the inclusion of advanced nuclear in a zero carbon energy strategy? 3) How can regulatory licensing processes be streamlined to help SMRs compete with outdated energy infrastructure? Before discussing what role SMR should play in the energy mix, I would like to know (1) what is the all-in cost per kWh (or MWh) for the NuScale SMR? (2) what subsidies (i.e., wavier of liability) are required to implement the system? (3) What are the costs of decommissioning the fuel and the plant and who pays those costs? SMR is carbon-free so it a possible energy source for reducing emissions. But renewables coupled with storage, demand response, smart grids, etc. can provide reliable “baseload” power for much less than current nuclear plants can. Also, renewables can be deployed much more quickly than nuclear plants can be. I hope that SMR can play a role in eliminating fossil fuel plants, but they need to do so safely and as economically as current (and future) alternatives. Dan, there have been ample studies done that indicate that renewables can’t provide reliable baseload power. See this link for an explanation that also contains links to several such studies on the issue. In your statement you use that word “storage” that is so glibly misused by so many renewables advocates, as if utility-scale storage is an actual option. Hydro can’t be considered storage in any general sense since it’s only available at certain places and, even in areas with lots of dams like California, a few years of drought pretty much nixes that as a reliable backup option. Aside from nuclear power, there is no universally reliable non-fossil fuel option for backup that can be counted on for utility-scale backup. And backup is undeniably necessary up to full peak demand. All you have to do to see that is to look at Germany, the country that has gone whole hog into renewables. Even with all their solar arrays and wind turbines, there are entire weeks in the wintertime when their solar is producing virtually nothing, and sometimes wind is just as dead during those times. While they do buy nuclear-generated electricity from their neighbors at such times, they’ve also been mining lignite and opening new coal-fired power plants to provide “backup”, itself a disingenuous term since “backup” to renewables routinely provides well over half the power. It’s like calling the quarterback who plays 3/4 of the game your backup quarterback. The economics of nuclear have taken severe hits for a number of reasons over the past few decades, though somehow east Asia (China, South Korea, Japan) manages to build plants on budget and on time. But there are new modular non-light-water reactor designs (fast reactors and molten salt reactors, as exemplified by ARC and Thorcon, to name just two) that promise to provide extremely economical, safe nuclear options in the very near future, with designs that can be mass-produced quickly in great numbers, in prices below one dollar per watt—for reliable 24/7 power. That said, you’re likely to see those built in other countries since the USA has such an upside-down nuclear regulatory system in place that it stifles innovation. Nuscale has doggedly forged ahead but even for their lightwater reactor design—the type of reactor most common in the world—it’s been a long and expensive battle that’s not over yet. Tom: Scott lays it out below: Of course we could power our nation using efficiency, renewables, storage, and smart grid features like demand response. There is no requirement that clean energy cost less than what fossil energy costs, because fossil energy includes “external costs” that will be with us for thousands of years. But renewables are now cheaper anyway — even without subsidies — and the price of storage is coming down rapidly to the point where Tesla utility-scale battery packs are competing with gas peaker plants… and the battery cost will keep dropping! Hi Dan, thank you for your questions. For our first project in Idaho, our target LCOE is $65/MWh. However, we expect that with the learnings from each subsequent deployment, the cost of our plants will decrease, improving our competitiveness. On your decommissioning question, its important to note that nuclear facility owners fund the decommissioning and disposition of the waste the plants create – these funds are regulated by the NRC to ensure adequacy and appropriate use. Owners of other power plants – like natural gas – have no such obligation. Thanks Lenka. How much of the target LCOE $65/MWh is allocated to decommissioning and waste disposition costs? For several years I have heard from a “sea turtle” working with a foreign owned nuclear company in the US, talking about Jiang Zemin’s commitment to a nuclear scientific world. Lately he says the Chinese and Russians are “ahead of us” in exporting small nuclear systems and technology to anyone with money in any part of Africa. Nuclear proliferation threatens our very lives as much as climate change does. (One exception: Livermore NIF work, if deployed in space over D-D pellets, would be out of the range of terrorists, and avoid the very expensive Carnot part of all nuclear reactors on earth other than thermocouple stuff which is even less efficient.) For decades, special interests have engaged in what a friend calls a “liar’s contest” on costs, but the Chile solar stuff is based on straight PPAs. A PPA (Power Purchase Agreement) doesn’t say anything about the actual viability of a system. People have signed PPAs for space-generated power, if and when that ever becomes a reality. And power towers with 24/7 storage are still hardly reliable. Look at the biggest such project in the USA, the Ivanpah project in California. Their rosy predictions were embarrassingly dashed and they actually had to register as a fossil fuel plant because of all the natural gas backup they used. The promoters complained that the sun didn’t cooperate that year! As for the 24/7 storage, how many days would that last in worst-case weather? It sure didn’t work for Ivanpah, and I doubt Chile is any better, regardless of the claims of its promoters. They sure do fry a lot of birds there, though. In regard to proliferation, you might look more favorably on the Thorcon concept of ship-borne power plants, where the entire power plant is built on a ship. Such power ships could be parked along coastlines and navigable waterways in nearly every country and those countries could have all the advantages of clean, inexpensive nuclear power without ever having nuclear technology transferred to them, and terrorists would have no way to steal molten salt (with the fuel suspended in it) to make weapons. In a worst-case scenario where terrorists blew up such a reactor/ship with explosives large enough to release the molten salt into the air, it would immediately solidify (since its melting point is about 300°C) and fall to earth. The elements that make accidents like Fukushima and Chernobyl so potentially problematic, such as cesium and iodine, are chemically bound to the salt. No evacuation zone is necessary; in such a worst case there’s some radioactive salt in the vicinity that has to be cleaned up. If it falls into the sea it would quickly dilute to negligible levels. My exhibit “Gallery of Clean Energy Inventions” is linked at padrak.com/vesperman. Displayed are 18 Larger Generators, 29 Smaller Generators, 25 Advanced Self-Powered Electric Vehicle Innovations, 29 Radioactivity Neutralization Methods, 25 Space Travel Innovations, 20 Technical Solutions to Water Shortages, and a Torsion Field School Network. Pertinent to nuclear power are the 29 Radioactivity Neutralization Methods. The Geothermal Atmospheric Liquified Thorium Chemical Reactor (GALT) is 200 times more efficient than uranium-fueled light-water reactors. In 1953 the first 150 kilowatts GALT reactor is successfully operated for 100 hours in Oak Ridge National Laboratory for the Air Force. Small GALT reactors could power vehicles, planes, trains and ships as well as factories and neighborhood electricity generators. GALT power plants are far less complicated and ten times less expensive to build than highly pressurized uranium reactors because GALT reactors operate at atmospheric pressure. GALT reactors are not susceptible to meltdowns and can consume dangerous fuel from the uranium reactors. Had the US Government allowed commercialization of GALT reactors by the early 1970’s humanity could have unlimited clean safe inexpensive energy for millennia. To remove the threat to the oil monopoly GALT reactor technology was classified secret. After a half-century the Trump administration has declassified GALT reactor technology. Lenka: Good pitch for SMR’s. I can see sense in SMR’s and other nuclear technologies as part of the climate solution, but my question is, what policy changes are needed to help them on their way? Would a broad tech-neutral policy like a carbon tax be enough or would it take more? For example, are there existing policies that discriminate against SMRs relative to wind, solar, etc. that you would like to see abolished? If so, can you summarize them? Hi Ed, thank you for your question. Continued government support is important to the success of SMRs. For example, the federal government provided more than $51 billion in incentives over the last decade to help deploy renewable technologies. If the same types of tax incentives and mandates were applied to SMRs, the government could see a return on investment that is three times less expensive per kilowatt-hour (KWh) than historical investments in wind and solar. Many state-level policies for clean energy only include renewables, I always advocate for technology-neutral clean energy policies. Thanks for the response, Lenka. I am encouraged by your professed support for tech-neutral policy, although you and I may interpret that term somewhat differently. Personally, I would not characterize “tax incentives and mandates” as tech-neutral. The assumption is that the entire portfolio of high value energy efficiency, the entire portfolio of renewable energy, and the entire portfolio of energy storage — all together — cannot meet the global energy needs and in the time frame the globe needs to meet the climate challenge. And that somehow nuclear energy can do so more quickly and at lower cost. This is nonsense. Energy efficiency, reducing the need for energy, is always less expensive than energy generation from any source. It is also faster. According to the International Energy Agency report, ” “hidden fuel.” published in the Energy Efficiency Market Report 2016. Today, a third of the world’s energy consumption is covered by mandatory standards and regulations, compared with just 11% in 2000. Significant progress has been made in the areas of lighting, cars, and space heating, and to a lesser extent, appliances. But there still remains a big potential for improvement since 70% of global energy consumption is not subject to mandatory efficiency standards. The American Council for an Energy Efficiency Economy (ACEEE) research has shown a dramatic growth in energy efficiency’s role in the electric sector — estimated that today it’s the United States’ third largest electricity resource – contributing more to our grid than nuclear power. ACEEE contends it’s not just one of our most common resources, it’s also typically the lowest-cost way to meet customers’ energy needs. New data by Lazard on levelized costs of electricity supply resources released in November 2017 confirms that by helping customers install efficient appliances, insulate their homes and buildings, and refine operations and maintenance practices, utilities are still investing in the lowest-cost energy resource out there. The world can reduce it’s electrical and fuel needs by one-third through high value energy efficiency faster and lower cost than any other energy source, especially nuclear power. A host of studies beginning with Lazard, concludes that most of the entire portfolio of renewable energy is less expensive than nuclear power and can come on-line faster. Looking at the USA for the moment, MIT showed that geothermal can meet 10% conservatively of US electric power, 24 hour power, and half of the resource is under the Appalachian chain. Oakridge National Labs reported that waste heat can conservatively meet 8% of US electricity and heat needs, also 24 hour power. A joint study with the Electric Power Research Institute (EPRI) concluded that ocean energy (marine, tidal, wave, ocean currents and thermal) can conservatively meet 10% of US energy needs, 24 hour power. A joint federal lab study led by the National Renewable Energy Laboratory (NREL) and Sandia National Labs concluded that concentrated solar power (CSP), 24-hour utility-scale power, can conservatively meet 10% of US electricity. And our national energy laboratories have shown that using biodegradable waste biomass – as biogas, dead trees, contaminated grains, food processing wastes, untreated demolition wood (including crates and pallets) could meet 8 – 18% of our electricity needs, 24 hour power. So 30% reduction with energy efficiency and 50%+ from 24 hour renewables, meet 80% of total energy. The Department of Energy NREL reported that wind can meet 20 percent of US energy needs, and is one of the lowest costs of electricity generation. Photovoltaics (PV), solar thermal and solar daylighting can cost-effectively meet 15% of our electricity easily. (Many studies show that photovoltaics has a much greater potential). The year 2018 showed bids for PV with battery plants coming in lower than coal or natural gas. And several studies, including the Rocky Mountain Institute (RMI) shows that battery storage is at full electric grid parity by 2020, and other studies that pumped storage is absolutely economical with gigawatts being financed both in the US and globally. Aside that nuclear power plants take longer to build than any other type of power plant, uses more clean water than any other type of electric power plant (clean water that we do not have to spare), has wastes products that take significant political and financial resources to deal with – there is no way the technology becomes a serious option at the scale, speed, and costs our world needs to address greenhouse gas reduction. It is a fantasy. And finally, the electric grid is following exactly in the foot steps of telecommunications (both wired and wireless self-healing grids), of information and data (with wires and wirelessly connected data centers in self-healing grids), and now the electric grid (with wired smart grids, tied to microgrids and distributed generation that can connect and disconnect seamlessly). Nuclear is anachronistic because it does not have the agility of distributed electric generation resources which now include natural gas and propane, but moving to hydrogen fuel cells, combined heat & power, energy storage, and the entire portfolio of distributed renewables. While nuclear energy can boil water, it is not a front line solution to addressing greenhouse gas reduction, and would require levels of capital that could not be raised and sustained. Seems this system requires a link to a separate URL with no way to embed a graphic. Here’s the link. That graph shows what energy demand would be if everyone in the USA used half as much energy as we do now, but if everyone else in the world also used that much. It contains a population line to demonstrate that the high demand is due not so much to population increase as to the fact that billions today live in energy poverty. This shows that to achieve any sort of energy egalitarianism we’re talking about vastly greater energy supplies being needed. Efficiency is great, but it’s not an energy generator. And to halve energy use in the USA would certainly take some energy efficiency strategies that would be formidable. Too often, those who tout efficiency as a major part of a solution disregard the fact that everybody wants to have an energy-rich life, and that social justice demands that we accommodate those very reasonable desires. Your post assumes very high costs and long build times for nuclear. This is certainly warranted if you look at recent US history or some of the nuclear blunders of recent years such as the EPR. But France was able to go nearly all nuclear in just 11 years, and Sweden too is virtually all nuclear and hydro (about 50-50, hydro being far more available there than in most countries in the world). The mass-producible reactors currently being planned (based on well-proven technologies that have been operated for years—sometimes decades—in national labs and in other countries) will be both fast to build and as cheap as a dollar a watt. Your litany of energy sources makes it sound so easy, similar to statements regarding how much solar and wind energy is coursing across the planet every day as if it’s easy to harness for our uses. Geothermal 10%? Where has this ever been even close except Iceland, sitting on active volcanoes? The hot spots have always been available, yet there are real problems associated with harnessing it on a sustainable basis (the rocks cool down as you pull the heat out). I’d love to see some breakthrough in that regard, and I’ve personally been involved with geophysicists who were working on various schemes, but so far it’s still pie in the sky. As for tidal and wave action, there again the raw power is impressive but devilishly difficult to harness, especially at utility scale. If you’ve ever had much direct experience with the ocean (and I have, with 20 years of working in the Bering Sea), you’d look skeptically at claims about how much energy can be harvested from it. Oceans find myriad ways to break everything, from corrosion to sea life attaching and fouling systems to punishing storms that wreak absolute havoc with man-made devices. And if you’re talking about commercial scale, let’s not discount the environmental impact such systems would have. It would make the cooling water issues of nuclear power plants look like child’s play compared to the howls of protest you could expect from the same organizations that now tout ocean power systems as a panacea. CSP? See my comments on Ivanpah further up the page. Biodegradable waste: Again you have the cost of both building the plants to convert it to energy and the continuing cost of collecting and moving it around. So your assumptions about collecting 50%+ of our energy needs from these sources is pretty glib, as are your assumptions about utility-scale energy storage. And all these contortions to show that we can get everything we (and the rest of the world) need without using nuclear power. I’ve already suggested this link above for those who want to explore the studies presented by critics of notions such as yours, so I’m not going to delve much further. Anyone interested can look there and weigh the credibility of both sides. When you say that “[nuclear power] uses more clean water than any other type of electric power plant (clean water that we do not have to spare)” are you being purposely disingenuous or do you really not understand the use of water in power generation? The biggest nuclear power plant in the United States, outside Phoenix, uses only wastewater. That same system could be used virtually anywhere, as can air cooling. It’s just a question of economics. Usually it’s cheaper to run that clean water (it doesn’t actually have to be all that clean) over the heat exchangers and back out to the water source from which it came, a few degrees warmer but otherwise unchanged. That tired old nuclear water use argument might work for the uneducated, but it’s a pretty cheap ploy. Those gas plants that are used so abundantly to “back up” (translation: provide most of the power) wind and solar facilities use the same sort of cooling systems as nuclear or any other thermal power plant, yet nobody ever seems to complain about all the clean water they use. What’s your gripe with nuclear? Waste? Argonne National Laboratory has already designed spent fuel recycling facilities to be built at commercial scale as soon as the DOE says go, based on pyroprocessing technology that has recycled over 30,000 nuclear fuel pins. And it can recycle the spent fuel from all types of nuclear power plants, both those we’ve already been using and those we will use in the future. You talk about fantasy. Nuclear power has already proven itself beyond any doubt (ask France and Sweden). All the newest designs are walk-away safe. I would submit that your smorgasboard of energy systems is far more fantastical than the idea of running the whole world with nuclear power. Your resistance to nuclear power seems more like ideology than science and engineering. long-term program of energy efficiency saving about 100 MWs per year. This is about average annual energy efficiency savings of major utilities throughout the nation,” The saving would also be equal to about 1/3rd of Dominion ‘s total current energy generation. Advocates who claim that we will always require at least some of our current technology, or need new technology, are basing their projected need on historical numbers. EIA has been criticized for their future numbers based on the historical model they use too. Comparing what they saw as the future of solar and wind with actual installed capacity clearly shows their serious under estimation of the level of generation that renewables would reach. Part of the issue is the steep drop in prices for all renewable technologies. Part is the underestimation of efficiency and demand response programs. Another will be the expansion of distributed generation. We have been looking at flat electricity demand for a while and even though the adoption of electric cars will create a demand increase equal to what economic growth used to supply, demand will continue to drop as distributed generation becomes a much larger part of the system. Add to that what storage will be able to accomplish when connected to on-site solar and a substantial decrease in centrally generated demand will occur. And don’t forget the 15% line loss. So we all need to look carefully for a decrease in central demand when we think of what will be required of the future. Some years ago CitiGroup projected saw a future drop in central demand could create a 50% reduction. If the first reactor is going to come online in 2026, that’s a long time to wait. What will the cost of solar, wind and storage be by then, if they continue to fall the way they have been for the past decade or more? I don’t have a problem with SMRs in theory, but they’re just one of many new technologies that may or may not pan out. A carbon tax would benefit all of the carbon neutral innovations, but I don’t see a reason to single out a particular technology like SMR that is so far from commercialization and whose expected cost is not even being hinted at in this discussion. Hi Jason, thank you for your question. While it is true that wind and solar have declined in price in recent years, electricity production from intermittent renewables and from nuclear are not always comparable. Systems that rely entirely on wind and solar will go through periods where they generate more electricity than can be used, which makes their cost irrelevant. If the renewables production curve does not match consumers’ demand curve, then the system requires a mixed supply system that can cover periods when wind and solar are not producing. By adding reliable, flexible carbon-free energy, NuScale cancomplement solar and wind and enable even more renewables on the grid. However, there is some hope. Apparently this dismissive attitude toward nuclear is not shared by all of her allies within the progressive camp, because there was a lot of blowback on this, and other elements of her FAQ. As a result of the criticism, the FAQ was taken down within a few hours of posting. However, a few sites have reposted it, so it can still be read. Currently, the proposition that we should address climate change by building nuclear power reactors is based on a couple of bad arguments. One of these arguments is made by a model of a flawed, safety-critical structural system that has been non-destructively inspected in a search for the flaws that lie within it, if any. The other argument is made by a modern global warming model. It would be foolhardy for a public policy to be based on both arguments as these arguments exhibit logical flaws that prevent the models from providing the policy makers with any information. These policy makers are “flying blind,” so to speak.